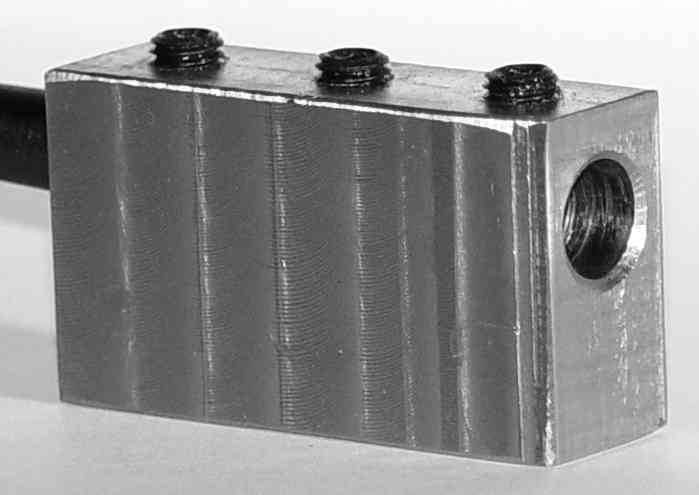 This is a steel boring bar holder for the minilathe, pictured below on edge with a boring bar installed (projecting out the back). These holders are hard to find in the size needed for the minilathe. The only commercial holder I could find for the minilathe was part of an expensive quick-change toolpost set, which I didn't want to have to buy. The narrower thickness of the holder is nominally 5/8 inch to just fit into the lathe toolpost, and the hole accepts 3/8 inch shank boring bars. To attach it to the lathe, you insert a boring bar and clamp it with the setscrews, then clamp the holder in the toolpost. This was an early attempt to learn how to adjust the mill Z-axis to end mill to stated thicknesses. I started with the clean rectangular steel stock that was the result of my first test of the mill (shown on my Solo Moving project page). My target thickness of 0.625 came out as 0.6175 because I hadn't yet figured out the backlash compensation on the quill. Indeed, you can see a shelf on the closest vertical edge where I made a first pass that was way too deep. The 2.000 length wound up as 1.972 after I got a little carried away with the side milling practice. The bore is a bit scuffed from using regular twist drills; I didn't have a reamer to finish a proper bore. The bevel on the bore edge was applied with a (chattering) large drill bit. At least all these goofs I made had no impact on the function of this tool. Gradually, I am learning the discipline of getting what you want out of metal. I also got to practice drilling deep into steel for the 3/8 by 2-inch hole. 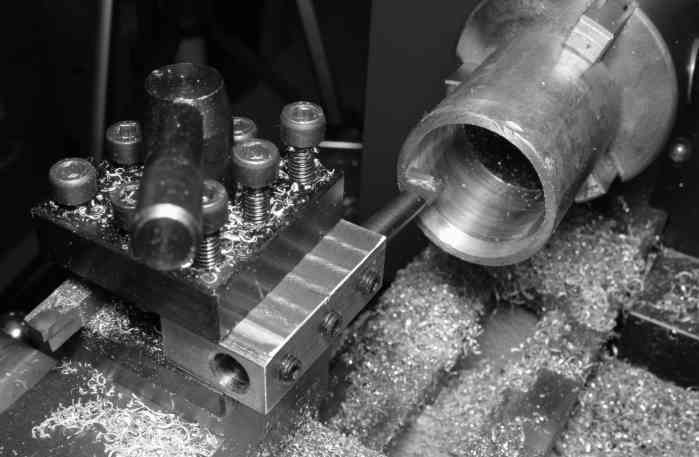 This was the first chance to use the mill-drill as a drill, and the 4 holes let me practice making accurate tapped holes, including the methods of marking, punching, center-finding, offset positioning, and tapping. The bore hole wandered about 0.020 to one side before exiting the far end; this may have resulted from using the progression of narrow pilot hole sizes instead of starting with a heavy bit. I used the 1/4-24 setscrews to clamp the bar instead of the usual slitted design. This was more of an expedience, since it saved a round of switching the mill arbor from the milling collet to the drill chuck and back (Somehow I had developed a burr in the R8 holder on the mill, and I needed to repair that before making any more switches.) I also wasn't sure if I knew the right tolerances in the hole size to clamp the bar with a slitted hole. The setscrews hold the bar well enough in this small size. Shown below is the holder with boring bar, mounted in the lathe toolpost, viewed from the rear of the tailstock. For practice, I am putting a smooth bore on the inside diameter of a piece of 1.5 inch steel pipe. Below is the same 2.5 inch length of 1.5 inch schedule 40 steel pipe seen above on the lathe, but being slitted longitudinally in a drill press. 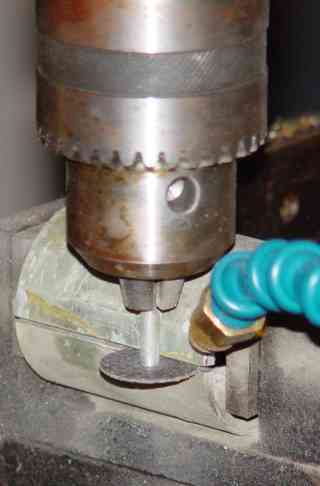 The cutter is a Dremel abrasive disk, held in the 1/8 inch Dremel collet which is in the drill press chuck running at high speed. The pipe is clamped in an inexpensive import X-Y drill press vise. The Dremel disk yields a slit of only about 0.060 inches of kerf. Compare this to the thinnest slitting saw typically available, which is 5/64 = 0.078 inch thick. Cooling and lubrication are vital to this abrasive disk cutting. I first tried cutting dry, and spent two disks cutting a mere 1/4 inch of the slit. Then I hooked up my Kool Mist system (seen here as the turquoise Loc-Line tube with brass nozzle), and cut the remaining inches with hardly a dimunition of the disk size. If you don't have this wonderful Kool Mist apparatus, then perhaps drizzling water or oil would work as well, although messier. Have a comment or question about my small metalworking projects?